Barça Lassa kept up their positive run in the league and this Friday they added their tenth consecutive victory against Jumilla. Andreu Plaza’s side supported Rómulo, who has had his knee operated on, and they lost 6-1 at the Palau Blaugrana. Jumilla, who are bottom of the table, were beaten by Barça and they remained top of the table after having imposed their quality thanks to goals from Joselito, Dyego, Roger Serrano (2), Ferrao and Tolrà helped them secure three more points. From the start of the game, Barça Lassa set up camp around the opposition’s box for most of the half. They attacked with speedy combinations and the blaugranas were completely in control and they soon took the lead thanks to a Joselito score and Dyego added a second with an impressive strike. Barça were comfortable in defence and they didn’t let their intensity slip. Paco Sedano had little to do in Barça’s goal with the team from Murcia rarely threatening. At the other end, the Catalans regularly threatened with Tolrà hitting the crossbar with a powerful shot. With Barça moving the ball around comfortably and creating changes with ease only Thiago Soares came in the way of a more convincing score line at the break. After the break the game changed. Jumilla came out looking to play more expansively and this made Barça’s life harder. Fernández scored a goal to bring the scores back to 2-1 and at this point the Catalans took control once again. The difference was down to one goal and Andreu Plaza’s side were looking for a goal to re-establish their lead. Batista tried but Rafa Luque made a save. Roger Serrano was able to score the third goal in the 28th minute from inside the area. Barça recovered the control of the game and Ferrao got on the scoreboard with his side’s fourth of the night. With the score at 4-1, Jumilla opted for the player-keeper option with over four minutes left to play. Barça defended well and Tolrà and Roger made the most of the openings to score the fifth and sixth goals from inside their own half. 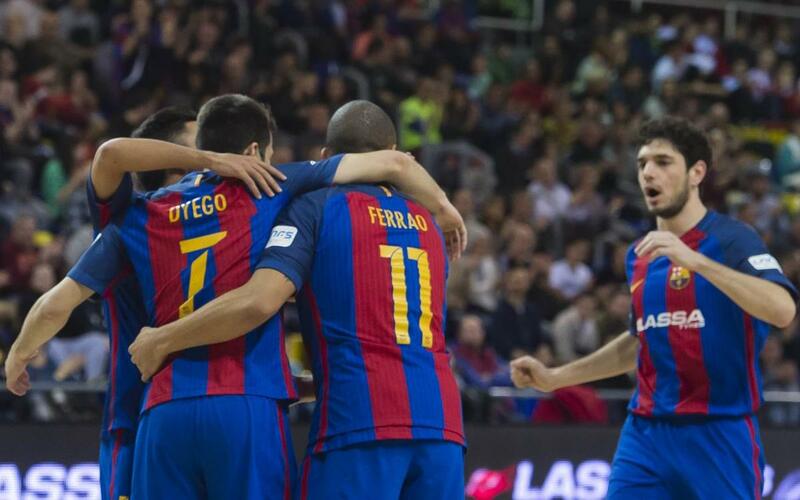 This confirmed Barça Lassa’s tenth consecutive victory for a team with 46 points who remain top of the LNFS.